In Suosso’s Lane, creative writer and journalist Robert Knox revisits the history of Plymouth, Massachusetts, “America’s hometown,” at a time when immigrant factory workers struggled to make their way in an America of long hours and low wages. The book traces the circumstances that led to the notorious trial and widely protested executions of Nicola Sacco and Plymouth dweller Bartolomeo Vanzetti, targeted by local authorities for their radical beliefs and framed for a factory payroll robbery and the shooting deaths of two security guards. A recently published novel, Suosso’s Lane dials back the clock to revisit the flawed trial of Italian immigrant Bartolomeo Vanzetti, a believer in “the beautiful idea” of a classless society in which all would work for the common good. A sober-minded laborer, Vanzetti suffers from the exploitive treatment of industrial workers in the early decades of the twentieth century. Outraged by the greed and injustice that mar his idealistic hopes for the “New World,” he joins other anarchists in promoting strikes and preaching revolution. In 1920, during the infamous Red Scare period, Vanzetti and his comrade Nicola Sacco are framed by police looking for radicals and subsequently convicted of committing a spectacular daylight robbery and murder. After seven years in prison, even as millions of workers and intellectuals around the world rally to their cause, the two men are executed. Seventy years later, when a young history teacher moves into Vanzetti’s old house in Plymouth, Massachusetts, he learns of a letter that might prove Vanzetti’s innocence. His attempt to uncover the truth is both helped and hindered by the actions of a local conspiracy theorist, the octogenarian daughter of Vanzetti’s lover, and a shady developer, and brought to a climax by a suspicious fire during his search of an old Plymouth factory. — Robert Wexelblatt, author of the short story collection “Heiberg’s Twitch,” published poet and Boston University professor. 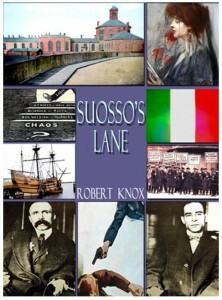 Get your copy of Suosso’s Lane.